​Babies crying. Cats climbing on the china cabinet. Water rushing in under the door, drenching the carpet. Dishes clattering. Sound chaotic? It is, and it’s all happening in the deep recesses of my grandmother’s mind. She is suffering through the hallucinations associated with the late stages of dementia. For six long years my grandmother has become increasingly confused and disconnected from reality. She seems to spend more and more time in some distant place which exists only within herself. It is not a peaceful place. The more time she spends there, the more agitated and afraid she becomes. When I walk in the room, she seems to know me for a moment. On a good day the recognition will last an hour at most. Once the dementia carries her mind away, that momentary glimmer of hope is gone until my next visit. I’ve often talked to God about my grandmother. Honestly, I did not know for certain if my grandmother knew and loved God. I don’t have a memory of her going to church, though my parents tell me that she did. The burden of whether or not my grandmother knew Jesus became a weight I carried. Deep questions haunted me. If a person with memory loss hadn’t made that important decision, would she go to heaven? Why would God leave her here to suffer like this? I didn’t see any possible way I would ever find the answers I sought. Our human minds are limited, but thankfully God has no limits! So even though I didn’t know the answers, I knew where to go with my questions. ​God cares for us. He knows our concerns. When we carry those burdens to Him, He comforts us in the most remarkable ways. The answer God gave me on this day came as an almost unnoticeable glimpse right in the center of a dark place. thanksgiving and the sound of singing (Isaiah 51:3 NIV). I was sitting across from my grandmother, watching her as she lay bundled under warm blankets. In between hallucinations she would hum a few bars while mumbling something unintelligible, and then resume her scattered thoughts and statements. After this happened a few times, I asked my dad what Grandmother was singing. Through one fleeting moment, God showed His presence. That day – that most precious, priceless day – God allowed me to see that even though her physical body weakens and her mind fades, He is still present with her in the depths of her spirit. And in true God fashion, He answered my difficult questions in one gentle tune - the sweetest hymn I’ve ever heard. 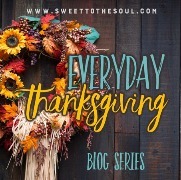 ​Today's blog post is part of our November blog series #EverydayThanksgiving. ​I’ve never been to Africa. I’ve never run a marathon …or a 10 K …or even a 1 K.
I’ve never sky-dived, parasailed, bungee-jumped, or baked a home-made carrot cake. I know women who have, and (dare I say it) to whom I have compared myself. Many of us do. Words to describe them? Brave, bold, impressive. Where do we fit in a world of accomplished women? What do we have to offer? More Than Yourself, Inc. is designed to support women in their spiritual lives, offering practical teachings mixed with real-life stories. 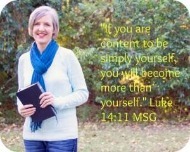 The goal of the ministry is to share a message of contentment over comparison, and to encourage the next generation of women to do the same. Winning the battle over comparison sets us firmly on the unique path God created for each one of us. Catch up with Kristine Brown on her website at More Than Yourself. It must be so hard to watch a loved one suffer like that. But what a beautiful confirmation and answer to prayer God gave you. To think that even if our minds weaken, God still remains in the depths of our spirits, is such a comfort. Thank you, Kristine, for sharing this. Its a small matter, but isn't it Isaiah 51:3 not 53:1 as noted in picture and first paragraph verse? What a sweet blessing the Lord gave you in your grandmother's singing! I'm learning more and more to watch for the tiny little gifts of hope and glimmers of light the Lord gives us. I'm afraid all too often I'm watching for the big things and I miss the little ones. "Good things come in small packages." What a beautiful post, Kristine. What a beautiful story. What a beautiful hymn you heard indeed. Priceless.